The 8th annual TCM Classic Film Festival came to a close on Sunday. 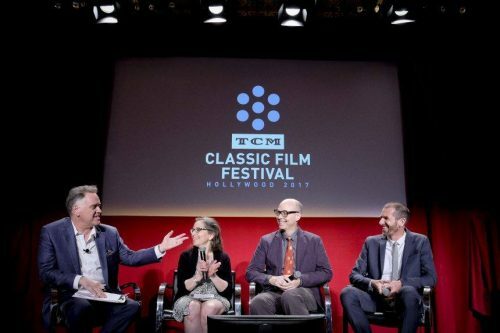 The festival, affectionately referred to as TCMFF, took place April 6–9 in Hollywood, and featured classic film screenings, special events, and appearances by film legends and experts. Left to right: Eddie Muller, Amy Heller, Bret Wood, and Jeff Masino. Photo: Tyler Golden. On Friday, April 7, Film Noir Foundation Founder Eddie Muller moderated a panel entitled BRING ‘EM BACK ALIVE: TALES OF FILM RESTORATIONS at “Club TCM” at the Hollywood Roosevelt Hotel, assembling a group of panelists at the forefront of bringing film restorations to home video: Jeff Masino, founder of Flicker Alley; Amy Heller, co-founder of Milestone Films; and Bret Wood, vice president and producer of special projects at Kino Lorber. Muller started off the event by pointing out that each panelist has a project nominated this year at the Il Cinema Ritrovato DVD Awards, including Flicker Alley and Film Noir Foundation’s Woman on the Run (1950) Blu-ray/DVD, restored in conjunction with UCLA Film & Television Archive. Milestone Films’ nominee is The Magic Box: The Films of Shirley Clarke, 1929-1987: Project Shirley Volume 4, while Kino Lorber is being recognized for Pioneers of African-American Cinema. As discussion turned to the topic of how restoration film elements are found, Muller noted, “It’s like a detective story.” Indeed, he pointed out that old-fashioned, physical detective work has not become obsolete in this age of computer databases. He related an anecdote of the time he called Universal to track down a print of Woman on the Run, only to be told that the studio did not have it. Unfazed, Muller asked, “Did you physically look for it?” While taking this action seems obvious, such grunt work can be overlooked in an era of reliance on digital systems. Muller’s prompt led Universal to track the print down in their archive. (It had not been inventoried in Universal’s computer database because they no longer owned the rights to it.) 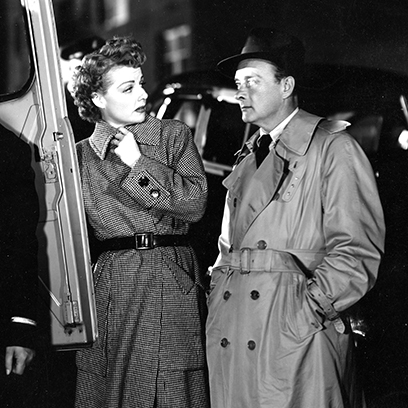 Ann Sheridan may have received help from Robert Keith’s police inspector in Woman on the Run, but no detective has earned the right to her gratitude more than Eddie Muller. Each panelist presented a clip that demonstrated the important, overlooked films their companies had brought to the public. Heller went first, presenting a clip of Shirley Clarke’s World Kitchen, a 1957 avant-garde film juxtaposing a series of contemporary restaurant signs of various world cuisines, creating not only a work of art but also a unique historical document. Later, Wood presented clips of Oscar Micheaux’s The Exile (1931), notable for containing audio elements of Micheaux voicing directions to his actors. The choice to leave Micheaux’s voice in the restoration for its historical value, rather than editing it out for the purposes of conventional narrative, is just one example of the complex decision-making process publishers face. 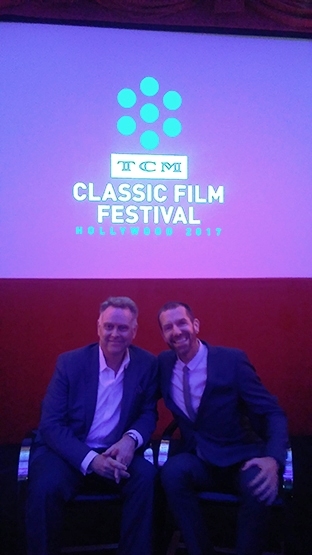 Film Noir Foundation Founder Eddie Muller (left) and Flicker Alley Founder Jeff Masino (right). Masino showed a clip from The Mating Call (1928), one of three films produced by Howard Hughes that Flicker Alley restored with funding from TCM, and which premiered on the network in 2004. The clip demonstrated the careful work that goes into reconstructing intertitles. In this case, it was a matter of reviewing original paper materials (an example of which Masino shared) indicating how many feet of film each intertitle was to appear onscreen, from which the seconds could be construed. One challenge the panelists lamented is the seeming inevitability that once they release a restoration on home video, new footage is discovered six months down the line. Commentary ensued on how many times a collector is willing to purchase the same film, although all agreed that certain films, such as Metropolis, will never oversaturate the market concerning new editions. Muller asked the panelists if there was one film they produced in particular that they had developed a personal relationship with. Heller’s picks were the films of Shirley Clarke and Charles Burnett. Wood chose Pioneers of African-American Cinema, which was honored with the National Society of Film Critics’ Film Heritage Award. Masino did not hesitate to mention “the Howard Hughes films,” before adding Abel Gance’s J’Accuse and La Roue. Heller spoke of a much sought-after Shirley Clarke feature, The Cool World (1963). Wood mentioned exploitation films, an interest of his that led to the release of graphic road safety films like Red Asphalt. Masino contemplated the question and then had this to say.